Crispy Leaf Potatoes - the BEST roasted potatoes you'll ever make! 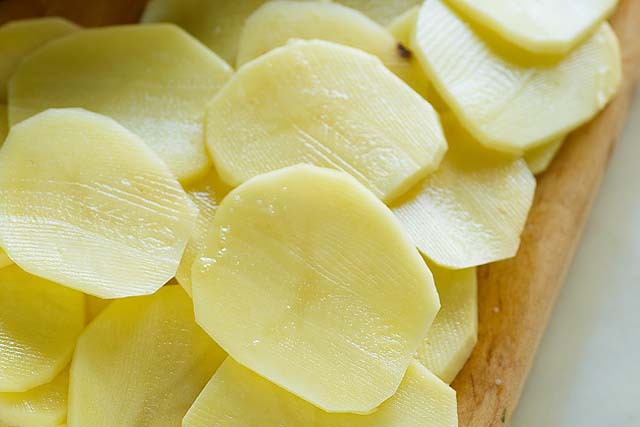 Crazy delicious sliced potatoes that taste like layers of potato chips. Make this for holidays or every day!! 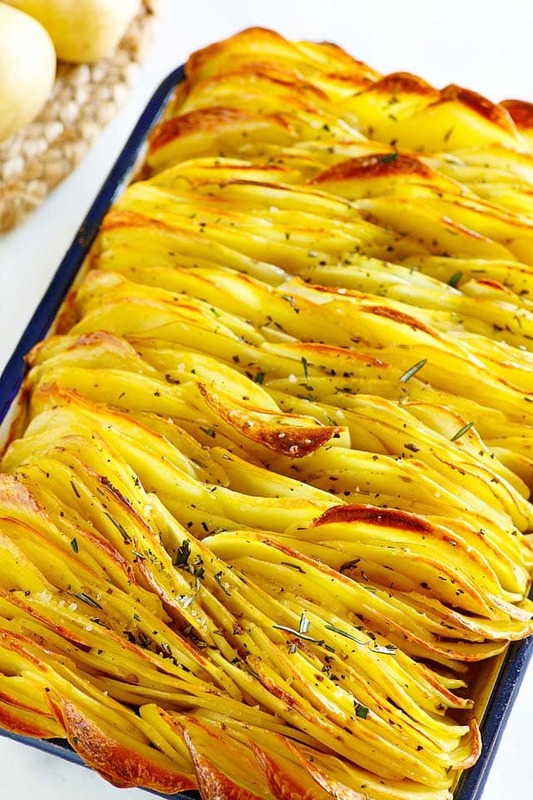 Leaf potatoes are roasted potatoes by Australian celebrity chef Donna Hay. 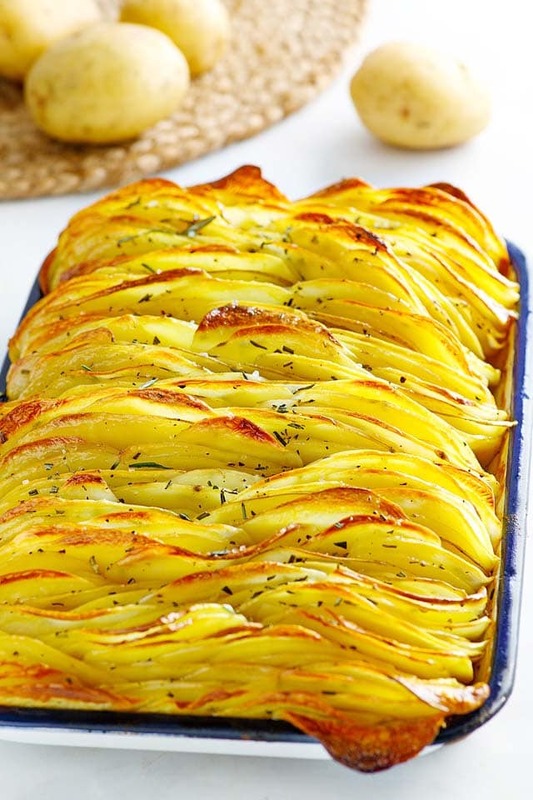 The potatoes are sliced thinly and they are arranged piece by piece in a baking sheet. As the potatoes are paper thin, and they do look like leaves, hence the name leaf potatoes. The BEST Roasted Potatoes for Holidays or Every Day! You haven’t tried roasted potatoes until you have tried these crispy leaf potatoes. Believe me! 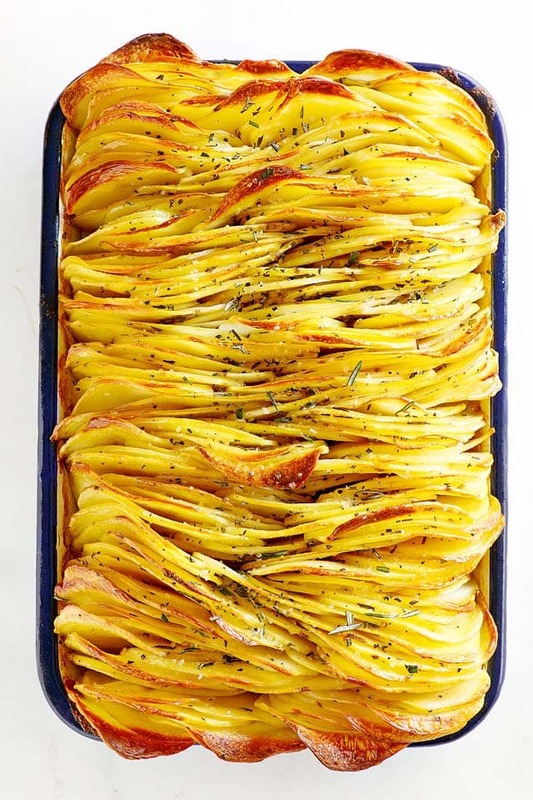 Imagine layers upon layers of super crispy potatoes that taste like potato chips, seasoned with rosemary, butter and salt. My mouth is watering at the very thought. The texture is unlike any roasted potatoes I have ever tasted. I personally think that it’s way better than hasselback potatoes, smashed potatoes or scalloped potatoes. How Do You Make Crispy Roasted Potatoes? 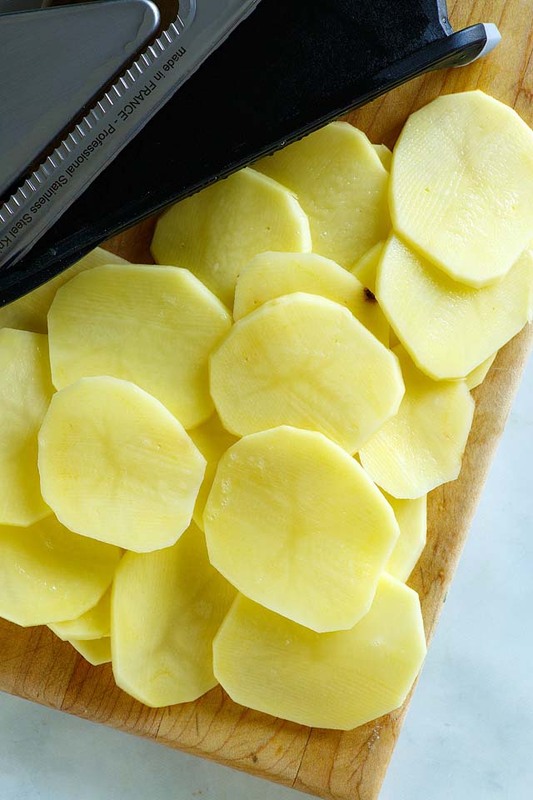 Use a Mandoline Slicer to slice the potatoes to thin pieces. Click here to buy. Dab off the moisture on the potato slices with paper towels. 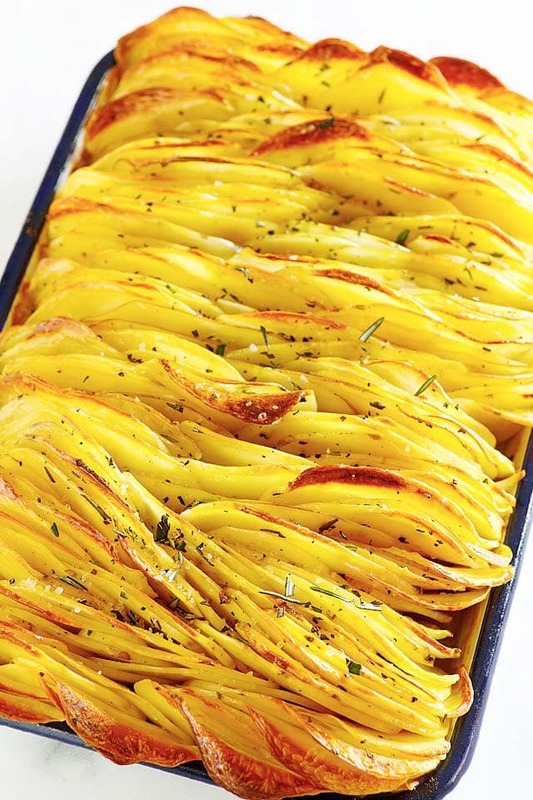 Arrange the sliced potatoes upright in a baking pan and bake at 400F. Butter or Duck Fat for Roasted Potatoes? The original recipe by Donna Hay calls for duck fat. Any foodies who have tried duck fat with roasted potatoes will never go back to butter again. For this recipe, I used butter, but go ahead and use duck fat if you like. Duck fat is supposed to be “healthier” as it has higher percentage of monounsaturated fat, at 55% while butter has only 26%. Layers Upon Layers of Crispy Goodness!! Crispy leaf potatoes is an amazing side dish any time of the year. They are perfect for special occasions such as Thanksgiving or Christmas. The reason is simple: they are very easy to make, with simple ingredients, but the presentation has a wow factor and the taste and texture are absolutely delightful. Try this recipe, and use duck fat, if you will. Enjoy! 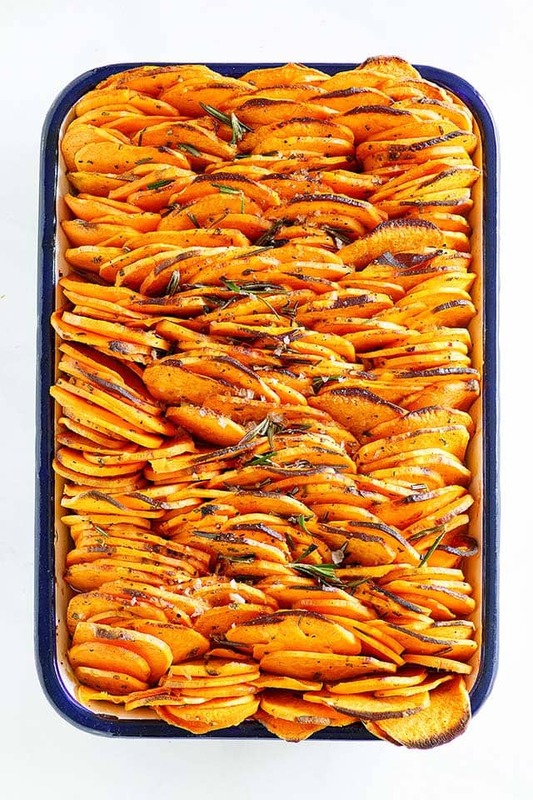 You can also turn this recipe into sweet potatoes, check out this Crispy Baked Sweet Potatoes recipe. 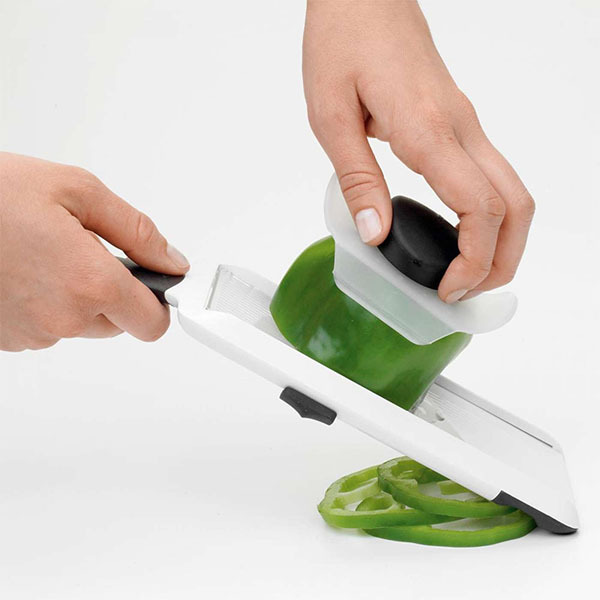 I recommend the following OXO Good Grips Adjustable Handheld Mandoline Slicer. It’s available on Amazon for $14.99. This meal is best served with a main dish such as steak, pork chops or chicken. For a wholesome meal and easy weeknight dinner, I recommend the following recipes. Crispy Leaf Potatoes - the BEST roasted potatoes you'll ever make. Crazy delicious sliced potatoes that taste like potato chips. Make this for holidays or every day! 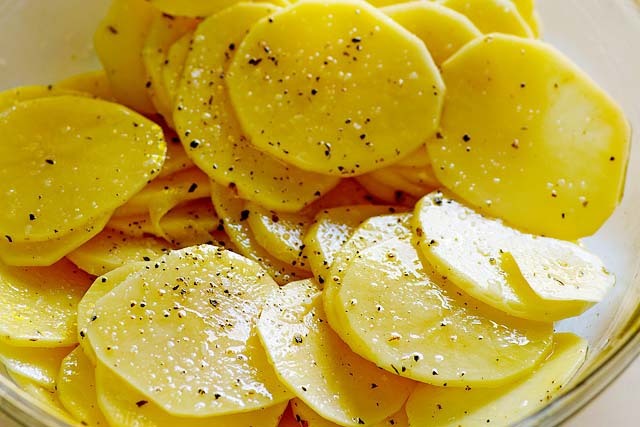 Using a Mandoline Slicer, thinly slice the peeled potatoes length ways. Pat dry the potatoes with paper towels. Place the sliced potatoes in a large bowl. 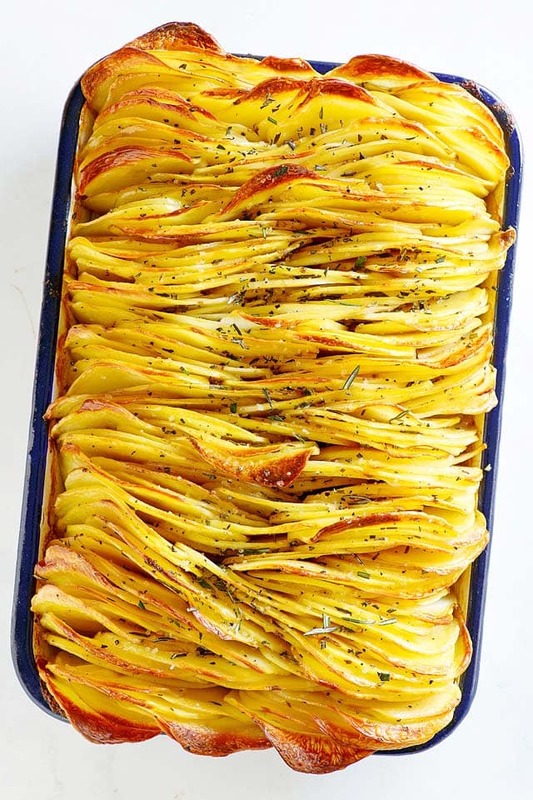 Using your hands, toss with butter (or duck fat), 2 teaspoons salt, black pepper and about 2 teaspoons of chopped rosemary until fully coated. Carefully place the potatoes upright, from left to right, in a baking tray (I used a 8x11" baking tray) until the tray is full. Do not pack in the potatoes too tightly, as this impacts the crispiness. 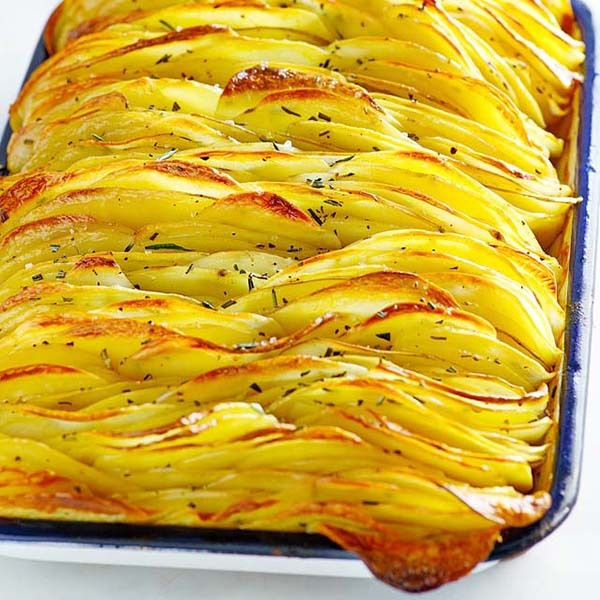 Bake for an hour, or until the potatoes are golden and crispy. Garnish with the remaining salt and the rosemary or oregano. Serve immediately. Recipe sources: Donna Hay and Peter's Food Adventures. I see that it says to put in the oven at 400 degrees. The problem is, I have gone over everything and cannot find what the approximately time is to leave it in the oven. Could you please respond to me. There are so many things in between telling us about the recipe, that I can’t seem to find the whole recipe. I would really appreciate it if you could send me the recipe together without all the extras…just the recipe please. Hi Tammy, the recipe is at the bottom of the page, keep scrolling down. Diane, the recipe is at the bottom of post. Do you scroll down??? This looks like the PERFECT potato recipe!!!! YUM! Yes, this leaf potatoes are absolutely amazing!!! Perfect 100. 9 lbs of potatoes for 8 people? Over a pound of Potatoes per person? Is this right? You can serve the dish to 10-12 people, up to you. Do you melt the butter? How do you keep potatoes from turning before you get to stacking in the tray? How does it stick to the potatoes? Is the tray shallow/buttered? Do you put something under it so it doesn’t drip butter? Yes, the butter needs to be melted. What do you mean by the potatoes from turning? What sticks to the potatoes? Yes my tray is pretty shallow as you can see, about 1 1/2 ” high. You can grease the baking tray. You can put sliced potatoes in cold water to keep them from turning brown (if that’s what you mean) then you can dry them off when you are ready to start stalking them. Do you mean 9 lbs. or 9 potatoes? Thank you I did end up finding it – I hadn’t scrolled all the way down to the bottom of the page. Thanks Diane, I am glad you found the recipe of this crispy leaf potatoes. Are you kidding me? 9 pounds of potatoes? Are you cooking for a battalion of troops? How about a recipe for a normal family of 3 or 4 people. These portions are useful for a truck stop cafeteria not for home use unless someone has 20 people living at home. Very unrealistic. Lance – this is a recipe from Donna Hay cookbook. The recipe calls for 9 lbs of potatoes, I was just following the recipe. If you have 3 or 4 people in the house, just cut the recipe into half. I made this recipe specially for the upcoming Thanksgiving and holidays, when there is a bigger crowd during holidays. There is no need to be rude and crude in your comment as I do not appreciate it. Lance, It does not take a brain surgeon to adjust recipe amounts to # people ! and show a little more class & respect in your comments. Thanks Peter for your support. Lance, Just. Divide. By. Two. (2). That ‘New Math’ is so difficult. Rasa Malaysia, this looks spectacular as well as delicious, as all your recipes do! I cannot wait to try it! Very sad world we live in when people are rude over a recipe. No wonder countries are at war. Rasa you just keep sharing your wonderful HUGE recipes. There are those of us that truly do appreciate your time and effort in sharing..Have a great day. Thanks Loejoe, I appreciate your support for this crispy leaf potatoes recipe. Guess Lance doesn’t know basic math skills. Quite sad actually. I made the potatoes today and they were fantastic!! Everyone loved them. Thanks for a great new recipe “keeper”. Your potatoes look like Yukon Gold potatoes. Is this what you used, or just the regular russets? You can use Yukon Gold or Russets. I made this tonight for company. I used about 3 lbs of potatoes so had to guess a little on measurements. I sliced them very then and had a soppy mess that wouldn’t stand up well in the pan, but I just took them and smooshed them up as best I could, baked over an hour. They didn’t look exactly like your but close enough. Any way, they were OUT of this WORLD!!! So delicious and crispy edges and there were none left. They are clearly very forgiving and this recipe is a keeper. THANK YOU!! You recipes are always among my favorites. I think this dish looks amazing. I plan to make for Thanksgiving. I am rating a 5 even though I haven’t tried yet because it looks delicious and seams to be very easy to make. What could be better than crispy potatoes and butta. All I can say is ‘wow’ – love it! Thanks, yes, these leaf potatoes are wow! Do you think you could make these with olive oil. Hi Tammy, I am sure you can but I am not sure of the results without trying. I’ve never seen so many crazy comments for a recipe someone took the trouble to share. This looks delicious. Will try with duck fat. Thanksgiving!! Hi Laila, thanks for your sweet comment. Yes this crispy leaf potatoes will be a great recipe for Thanksgiving. This looks amazing! I can’t wait to try it! I have a small family. I’ll need to halve all ingredients. An 8X8 inch pan or 9X9 inch pan should work. Right? And bake time is still 1 hour? Thank you! Could one try EVOO in place of duck fat or butter? I’ve made ranchy roasted potatoes with oil and was wondering if you thought that would work for this recipe? Thanks! I think so, I don’t know how it affects the crispiness. Excited to try these tonight using some brown butter ghee I have so I can make them Whole30 compliant! I can’t wait to try this. Our family has never met a potato dish they didn’t like. This is a beautiful presentation, and I’m sure it’s delicious. What’s not to like? :). Thanks so much! Yes, you will love this crispy leaf potatoes recipe. Hi there do these come out like chips or do u just cut a slice out at eat them? was thinking of making something to dip them in… thanks. Yea, you take some and eat. The top part is crispy. I don’t think you need dipping. You might be able to get duck fat at your grocery store. Ask them. If not, Walmart, Amazon, Sur La Table has it. This looks phenomenal. Making them for Christmas. And found duck fat at Wegmans…. Has anyone made this ahead of time? Looking at dishes I can make the day before / morning of… wasn’t sure about this one. I’m still saving it because it looks delicious!!!! Any tips are welcome! Once made, for how long can it be stored? You can keep it overnight but they won’t be crispy. Im psyched to make these! I’m developing my menu for a small dinner with family that includes someone who is triggered to migraine so by several ingredients. This fits the bill to start building the rest of the menu…it’s taken me a lot of searching to figure out what I want to make around his issues, so thanks for giving me a starting point! Ive never used duck fat, is the flavor strong? Very good and easy to make. Nice change from scalloped potatoes and regular baked potatoes. Hola, Será posible hacerlas en horno microondas? Hello Rasa, I have a question. May I “pin” your recipe’s on my Pinterest boards? I am just a retired 70yr young Grandma that pins recipes like a hobby. I have a lot of time on my hands, & I love seeing & finding good recipes & “saving” them on my boards. I never save recipes & pretend they are mine, that’s why I leave all the information as I find them. So, do I need your permission to pin your recipes? The ones I pin, I pin so I don’t have to write them out. I have terrible arthritis in my hands. I would love your reply & I want you to know that I would never claim any recipe or picture to be mine unless it was. Again, that’s why I just pin. I’m not that smart when it comes to the computer. I’m lucky to figure out how to pin! Anyway, I love your recipe site & think you do a very good job at it. I will look forward to your reply. God bless & thank you, Vicky P.
These potatoes look delightful! Question: Do you eat these with your fingers? Or a fork? You can eat with both, it’s up to you! Hi Gwen, I am not sure. Did you bake on top rack? Try to cover the potatoes the next time you bake. Will try that again. Thanks!!! How do you save a recipe? I have tried all different ways but nothing is working for me. Can someone help me please? Elizabeth, please register an account first and I will send an email on how to Save recipes. Think it is very rude how so many people picked on Lance. I think we all have times when our brain just doesn’t think. Now I have a question. It says 601 calories but is that for the entire thing or per serving and I’m assuming you are figuring eight servings per recipe. Hi Mary, yes, per serving. Not a good idea as water will seep out from the sliced potatoes. You want to quickly arrange and then bake. This recipe is so good, perfect for any holidays! This recipe looks awesome. I love butter and potatoes, but I’ve recently been told to cut back butter, so…I’m wondering if olive oil would work. Anyone try it yet?